Weaker house markets in Sydney and Melbourne are pushing up rental yields for investors as purchase prices fall or rise more slowly than rents, Domain Group’s latest figures show. 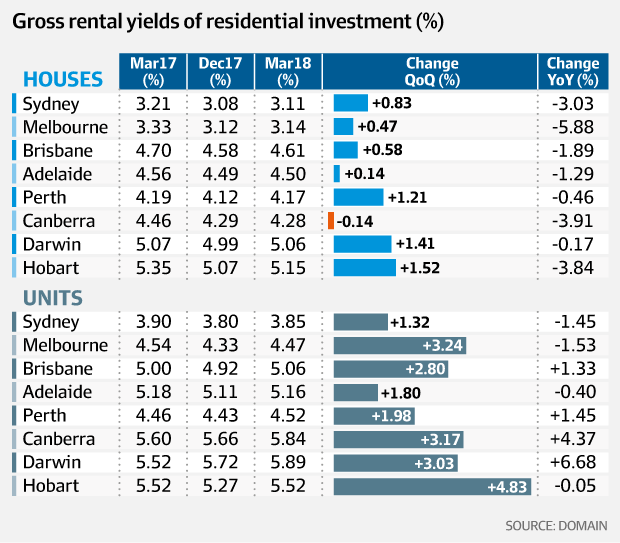 In Sydney, the most expensive city for housing, the gross yield on houses picked up to 3.11 per cent in the March quarter from 3.08 per cent in December even as the median weekly asking rent held at $550, Domain’s quarterly Rental Report shows. The figures show the sharp turnaround in the residential market in the NSW capital, where house prices have cooled from their previous white-hot state to chalk up a 2.1 per cent decline in the first three months of the year. It’s a similar picture in Melbourne, where house prices have been more robust – they only fell 0.6 per cent in the first quarter, CoreLogic figures show – but where asking rents rose $5 from December to an average $430. “The rental price is growing at a greater pace than sale price over the quarter,” Dr Powell said. Domain is majority owned by Fairfax Media, publisher of The Australian Financial Review. Yields rose on houses in every capital city during the first quarter – with the exception of Canberra, where they slipped to 4.28 per cent from 4.29 per cent – and yields also improved in units everywhere. The figures show that while tighter credit rules are limiting new investors’ ability to purchase, especially in Sydney, one consequence is that the yields on properties for existing investors are starting to firm. While house rents in Sydney have remained flat, unit rents keep rising, and their March average weekly asking rate of $550 – on par with houses – was up 0.9 per cent on December’s $545 and up 3.8 per cent on the $530 average of March last year. 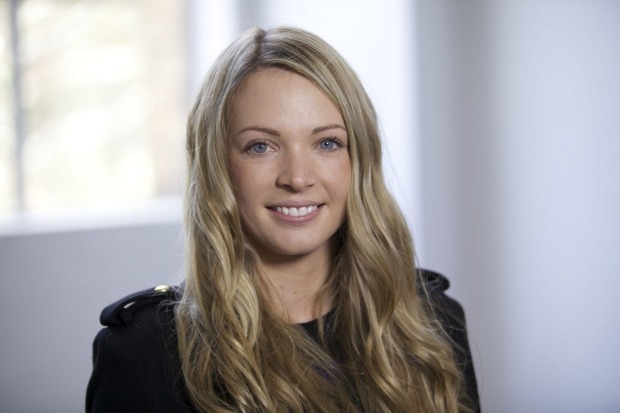 This could reflect the seasonal dynamic of more students and professionals striking start-of-year leases, but it could also be an indicator of less rental stock on the market as investors who were due to settle on purchases made a year or more ago were struggling to settle, Dr Powell said. 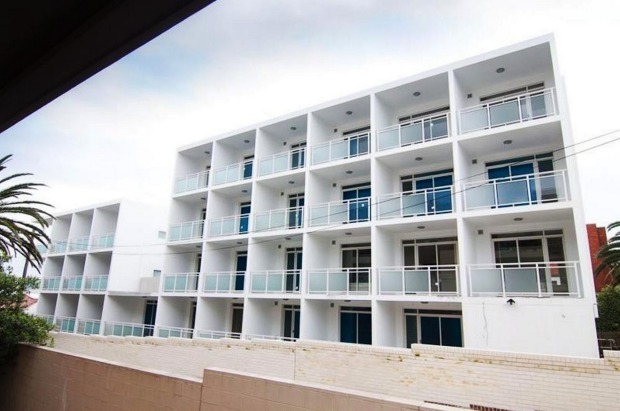 “Sydney’s unit rental growth over the March quarter is particularly noteworthy, although it may be a result of the season as students and professionals relocate for work and study,” she said. Hobart remains the country’s standout residential market. House asking rents stood at $420 in March – nearly on par with Melbourne – having jumped 6.3 per cent from December and 15.1 per cent from March a year earlier. Unit rents in the Tasmanian capital were also up 2.9 per cent quarter on quarter to $350, ,a 14.8 per cent year-on-year increase. “Surging population growth across Tasmania has driven strong economic performance in Hobart and contributed to another impressive quarter of rental market activity,” Dr Powell said. Hobart house gross rental yields picked up to 5.15 per cent in March – making them the country’s highest – from 5.07 per cent in December and unit yields also rose to 5.52 per cent from 5.27 per cent. “Further rental growth in Hobart is dependent on a rise in supply,” Dr Powell said.